Ganesh Chaturthi, or Vinayaka Chaturti, is the birthday of Lord Ganesha, the God of wisdom, prosperity and auspiciousness. Ganesh Chaturthi 2011 date is September 1, Thursday. Ganesha is today worshipped around the world and the Elephant-faced Hindu god is one of the most popular deities associated with Hinduism. 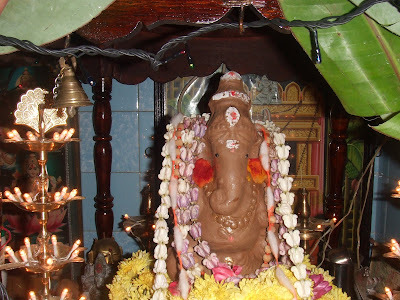 The Ganapati Festival ends with the immersion (Visarjan) of the idol on Ananta Chaturdasi day. Ganesha is the remover of obstacle - Vighneshwara or Vignaraja – and is always invoked when Hindus are beginning a new enterprise. It is believed that Goddess Parvati created Ganesha out of clay and breathed life into him. Letting him stand guard at the door, Goddess Parvati went to have her bath. When her husband, Lord Shiva returned, the child who had never seen him stopped him. Ganesha did not allow Shiva to enter and finally an enraged Shiva severed the head of the child. Goddess Parvati returned to find her son dead and was distraught and asked Shiva to revive him. Shiva cut off the head of an elephant and fixed it on the body of Ganesha and giving birth to elephant-headed Ganesha. Thousands of Ganesh statues are installed in various public places in India and in Hindu Temples around the world. Millions of small Ganesh idols are installed in Hindu homes in India, especially in Maharashtra, Goa and Andhra Pradesh. After the festival these statues are immersed in the sea (Ganesh Visarjan ceremony).